What a year of giving stuff away taught me about life, relationships, and what's really important. Packed with practical tips and spiritual wisdom. 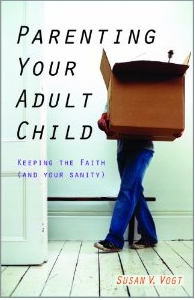 Let go of Cheap Faith and the "Smug Factor"
How to forgive yourself for parenting mistakes. How to move into an adult-adult relationship. Click here to read a St. Amthony Messenger summary of the book. by Anne Marie Witchger Hansen and Susan V. Vogt. A book of story starters and activities for all kids who want to make peace. Contains cartoons, family activities, books, videos, and thoughtful questions. Geared to grades K-6, students will enjoy making up their own better endings to potentially violent or bullying situations. Just Family Nights provides 60 activities for families to do together – activities that build family unity and foster healthy values. Each Family Night offers reading, activities, songs, and ideas for treats that are built on themes such as ecology, nonviolence, homelessness, conflict resolution, and awareness of other races and cultures. These talks were originally presented at Holy Name of Jesus Parish in eastern Florida.